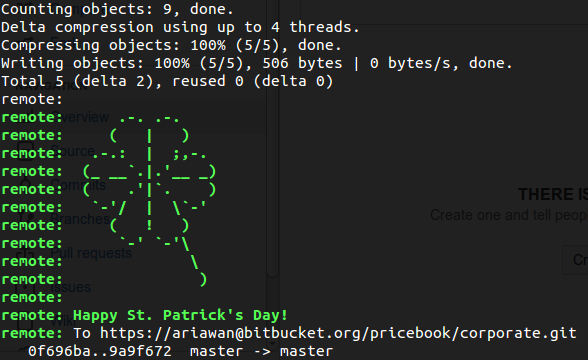 Are you using bitbucket service as your code repository? If the answer is yes, you might be noticed something different on message that shows after you guys did a git push. Nice message, happy saint patrick’s day for those of you for celebrate it! I am just wondering, is there any online services like bitbucket that celebrate moslem’s day? I will certainly do it, if i am making this kind of service in the future. Like “happy ied mubarak” after you push some code. haha.